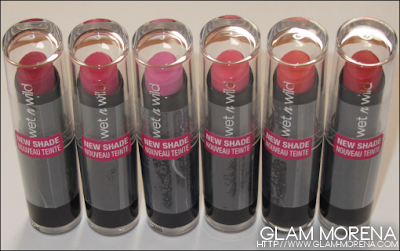 Glam Morena: Spring 2012 Wet n Wild Mega Last Lip Color. Spring 2012 Wet n Wild Mega Last Lip Color. Wet n Wild Cosmetics has many new products out for Spring 2012 that I will be sharing with you. I'm starting things off with the items I was most excited about. Wet n Wild came out with six new shades of Wet n Wild Mega Last Lip Colors! All perfect for the Spring and Summer seasons. Another plus was that they put the shade names on the bottom of the packaging. Retail Price: $1.99 - Now $1 lower than the previous price of $2.99! Swatches of the Spring 2012 Wet n Wild Mega Last Lip Colors! 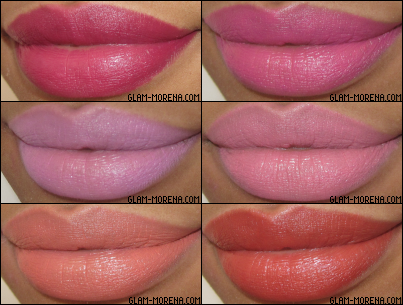 Lip swatches of the Spring 2012 Wet n Wild Mega Last Lip Colors! My Must-Have Shades: Cherry Picking, Don't Blink Pink, and Purty Persimmon. My Nice-To-Have Shade: 24 Carrot Gold - If you do not have Revlon's Siren. Also Wet n Wild Pinkerbell is said to be a dupe for MAC Viva Glam Nicki lipstick. Have you purchased any of the new shades? Favorites? Thoughts? 24 Carrot Gold looks great on you! I must have Pinkerbell. I need all of these! They look like they apply so smoothly. And if PInkerbell is a dupe, I need it. It looks like it applies a LOT better than the Viva Glam. The Carrot Gold color seems to be my fav in all your swatches. They look creamy and I like that. I don't like matte colors that dry out my lips so these look great. ALL those colors look so good on you! And for $1?! What a steal! whattt? $1? i need to pick some up! i like 24 carrot Gold and I also heard the same thing about Pinkerbell being a dupe for VG Nicki. i Want! oh i love them all! and since they are so cheap i may just have to get them all because i just can't decide!! I bought all of them twice! Great price and I will wear wet n wild over any other lipstick bc they are cheaper and thicker! The dollhouse pink is my fave! do any of these come close to duping MAC's Twig? I'm looking for a non-animal ingredient based lipstick. I know that the Megalasts are (the old ones)... not sure about the new release. I'll have to wait until WnW update their site. Anyone knows if any WnW dupes the Twig? Every single color looks so good on your lips ! Wish I had lips like you ! lol Gorgeous colors ! Wowo those shades are very gorge and pretty, yet wearable. I love them all. It's hard to shoose which ones are the best, because they all vary in shade. hi hun! 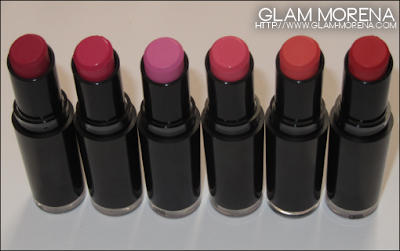 love these new shades.. i was wondering if you knew where these new wnw collections can be purchased in toronto? ive seen the normal colors at walmart.. thanks! Oh goodness! Your lips are beyond luscious. I need new word to describe your lips! it looks good on you those shades. Did you need to use lipliner for any of them? By the way, they look great on you!